Paul Glenney of the Nash Road Gospel Hall (Hamilton, Ontario) kindly submitted the post below. 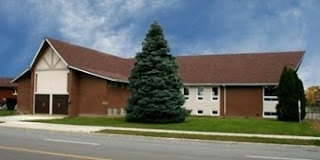 The Christians who once met at the Hamilton Road Gospel Hall moved to a newly renovated facility in November, 2009. The post below deals with the transition and the assembly's gospel efforts in the community. Here is a brief chronology of events since moving into the new building. It is only ten minutes from the former Kensington Avenue Gospel Hall so we have been able to maintain some contacts from the area. The lady who lives beside the old hall is picked up each Sunday night for the Gospel Meeting, unless she is unable to attend. Some children are also picked up in the area. In the months preceding our move we delivered, as well as mailed, to apartments in the area a Seed Sower John 3:16 text (5x7) and a card indicating that we were moving into their neighborhood. We moved November 13-14th and the following three Saturdays had a craft class focusing on Christmas crafts. Then on December 13th we had the Christmas dinner. It is hard moving into a new area and trying to make contacts. It is slow but we are in it for the long run, in the will of the Lord. To the neighbors on each side of our building we took a gift basket with texts and literature in it. We thanked them for their patience and understanding with us during the months of construction with its noise and dirt. It is really just another way of trying to gain the confidence of the people. We delivered about 800 baskets along with an annual calendar which had all the Sunday School and Gospel meetings marked for each Sunday in addition to special events such as Mother’s Day luncheon, Sunday School picnic and the Christmas program for 2010. Again these are small steps. We are not getting many folks in from the area yet but we keep working at it. Regarding our Christmas Program, we have tried this for a few years and are very thankful we have. We have a full Christmas Dinner with all the trimmings. We try to time the Program (with the children saying verses or recitations relating to the coming into the world of the Saviour and his death at Calvary) for about 7PM. This is the time of our regular Sunday evening Gospel meeting so if some of the neighbors unknowingly come for the Gospel meeting, they will still get the Christmas Gospel message. The recitation of verses is followed by a speaker for the children and parents - again with the focus on the birth and death of the Saviour. For this Christmas program, we get a large number of unsaved in which normally do not come to the meetings. It is fair to say conservatively we had in at least 40 unsaved adults that we normally would not get in. In all we estimate we had between 230 – 250. The Christians were encouraged by it and in the will of the Lord we plan on it again for 2010. While we have not yet been able to connect fully with our new neighbors we are continuing with the expectation that we will. Regarding the renovations to our new location, our project manager, Mike Da Silva, is a Christian. We have arranged a Sunday evening for Mike Da Silva and his son to speak in the Gospel. We are using this as an opportunity to invite all the trades and tradesmen, our real estate agent, etc. that worked on the building to the gospel meeting, tour the building to see the finished product and have a luncheon. Will they come? we don’t know but here again we are trying to use this to make some contacts for the Gospel’s sake. We carry on a Spanish Gospel meeting once a month on a Saturday followed by dinner. We always have some unsaved in for which we are thankful.